The eXplorist 210 is the third in its line, improving on the 200 in several ways: It has more available memory (22 MB), USB connectivity, and support for maps. Aslo included is a simple file memory system that makes it easy to download and manage coordinates and other information from the Internet. Advanced features include an area calculator to instantly see the distance and area between any points, and a vertical profile screen to see an elevation graph for the path ahead. The eXplorist 210 has three navigation screens as well as a Satellite Status screen that can be accessed by pressing the NAV button. Each screen provides the same information in a different format giving you the choice of choosing the screen that best suits your needs. With an active route, the top of the Compass screen displays the name of the destination. You can customize the unit to change the information displayed at the top of the screen (see list above). When there is no active route, the graphical compass performs like a standard compass, indicating to your heading referenced to true north. With an active route, the compass graphically displays an icon representing your destination. Position is displayed in textual format using the coordinate system selected. Computed accuracy of the position computed is displayed. WAAS is also displayed in the Accuracy field when the eXplorist is using WAAS information to increase the accuracy of the position fix. Date and time are shown, automatically adjusted from time information supplied from the atomic clocks in the GPS satellites. The Satellite Status screen is a handy way to visually see just how well the eXplorist is tracking and receiving satellite signals. The type of position fix as well as the number of satellites being tracked is displayed. Graphical indication of the location of the satellites, as well as their assigned number identifiers, are shown. A bar chart supplies information as to the signal strength for each satellite. A yellow bar indicates that the satellite is being tracked but has not been locked on yet, a green bar indicates that the satellite has been locked on. The fundamental starting point for any GPS navigator is Points of Interest (POIs). POIs are also know as waypoints. There are four types of POIs available for the eXplorist 210: POIs that you have marked (saved), POIs that have been stored in the unit as part of the built-in background map, POIs that have been uploaded using the geocaching software, and POIs that have been uploaded from a detailed map. These POIs are accessed from the same MENU option and can be used independently or combined to create routes. 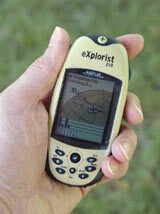 The eXplorist 210 lets you create three kinds of Routes: Mulit-leg, backtrack, and goto. Active track is recording your travels whenever you are moving unless you have intentionally turned it off. Active tracks can be cleared, stopped, and resumed, adding flexibility to recorded tracking. Active tracks can be converted to a saved multi-leg route, providing a quick and easy way to create routes that can be used in the future. BackTrack, a function of Track Logs, provides an easy, and quick way to activate a route that will return you to your starting position. Fish/Hunt: This will display the best hunting and fishing times for a position and date that you enter. Sun/Moon: This will display the rising and setting times for the sun and the moon for any position and date you enter. It also displays the phase of the moon for that position and date. Simulate: Provides a tool for putting the eXplorist into a simulate mode. With the simulator turned on, the eXplorist will operate as if it was moving. This provides a tool for you to use to try different functions while sitting at your desk or campsite. Communications: This is used to set your eXplorist into the mode you desire when it is connected to a personal computer through the USB port. You can set up file transfers, transferring NMEA data, or just using the USB cable to power the eXplorist. The Magellan Geocache Manager is a software application that runs in Windowsï¿½ on your personal computer. It is a place to create, modify, store, and most importantly, upload geocache points to your eXplorist. There are two ways of adding geocache points to the Magellan Geocache Manager. You can enter the points manually by typing in the information or you can download geocache points from one of the many geocache fan sites found on the Web. The Magellan Geocache Manager has a link to www.geocaching.com as a source for finding and downloading geocache points. The eXplorist has a File Structure system that is based on the file system that you are probably familiar with from using your personal computer. It is possible to save files in any of the folders but it makes more sense that you create new files in the associated main topic folder. The Detail Maps and Geocaches folders are empty until you upload a detailed map from mapping software, such as MapSend or geocache files from the Magellan Geocaching software. The files for POIs, routes, track logs and geocaching points are ASCII text files. When your eXplorist is connected to your personal computer, you can open these files using any text editor and modify them to your needs. Restart GPS – If you travel over 210 miles with your eXplorist receiver turned off, restarting allows faster position computation. Active Setup – Allows access to a preferred folder when saving POIs, routes, geocache points, or the maps. Changing Map Units – Allows adjustment of Nav Units, North Reference, Coordinate System and Map Datum. Setting Power Management – Options used to help preserve battery life in the eXplorist receiver. Personalizing – You can add your name and address information to the unit. Changing Languages – Choose from 10 different languages. Setting Alarms & Beeper – The eXplorist has 5 audible alerts: Anchor Alarm, Arrival Alarm, Off Course Alarm, GPS Fix, and Proximity Alarm. Setting the Clock – Change time format (AM/PM or 24 hour) and adjust Daylight Saving Time. One nice thing about the eXplorist 210 is its mapping capability – it can use the optional Magellan MapSend CDs. When I opened the box I saw a CD that said MapSend Software and I thought “Wow, that’s nice!” But my excitement turned to disappointment when I found out that all it was was information about MapSend software. The first-time start up locked onto four satellites in about 45 seconds, which is pretty good. Subsequent warm starts were around 15 to 30 seconds. I took the 210 geocaching and on the way there I had it sitting in the drink holder in the console, which is quite a way from the windshield. It managed to keep a lock on an adequate number of satellites the whole trip. Once out of the vehicle, it brought me to within 15 feet of the cache. 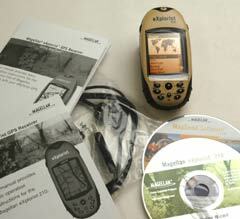 The Magellan eXplorist 210 has some useful features such as the file system, the verticle profile, page customization. Performance was good. Ease of use was average. For someone with GPS usage or personal computer experience, the file system is nice. Compared to the eXplorist 200, the 210 is a good value since it has more memory, map support, and USB connectivity for just a few more dollars. Free GPS Cell Phone Tracking: Why Pay to Know Where Your Phone Is? A blog about drones, autonomous vehicles, mapping technologies. Also, find discover satellite images of places and businesses around the world.